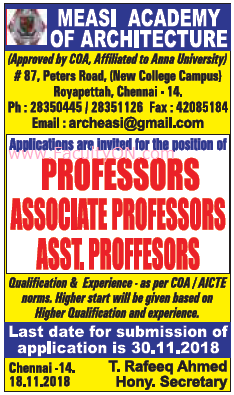 MEASI Academy of Architecture, Chennai has advertised in THE HINDU Classified newspaper for the recruitment of Professor / Associate Professor / Assistant Professor jobs vacancies. Interested and eligible job aspirants are requested to apply on or before 30th November 2018. Check out further more details below. About College: MEASI Academy of Architecture was established in the year 1999 and it now completes eleven years. It is approved by Council of Architecture and affiliated by Anna University. The Academy is one of its kind, as an independent college in Architecture from South India. How to Apply: Interested and eligible candidates are required to send application along with CV, copies certificates and mark sheets, passport size photographs to the following postal address or email address.